Is it Safe to Take Your Baby to the Beach? Babies are often more susceptible than adults to short- and long-term damage from ultraviolet (UV) rays, due to the delicateness of their skin. However, that doesn’t mean your family has to ban the beach altogether. In fact, there are benefits to taking babies who are at least a few months old to the beach. The texture of the sand, the sound of the waves, and salty ocean air all provide rich sensory experiences that aid in your baby’s development. Keep your baby out of direct sunlight. According to the American Academy of Pediatrics, babies younger than six months of age should be kept out of direct sunlight. This can be resolved by placing your baby’s stroller underneath an oversized sun umbrella or in a small outdoor tent for shade. 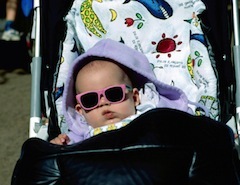 Also, check your current stroller to see if it has a pop-up sunshade that may have built-in UV protection. Use “chemical-free” sunscreen. Some sunscreens may be fine for adults but may not be tailored to your baby’s needs for sun protection. Look for a “chemical-free” sunscreen made with zinc oxide or titanium oxide, advises Pediatric Dermatologist Patricia Treadwell on babycenter.com. She says that any sunscreen that contains those two ingredients will protect against ultraviolet A (UVA) and ultraviolet B (UVB) rays as well. However, before slathering sunscreen on your baby, test it on a small patch of his or her skin to ensure that there’s no allergic reaction. Choose sun-blocking attire. Wide-brimmed hats paired with long-sleeve, sweat-resistant shirts and knee-length swim shorts provide fuller coverage for baby boys and girls. Some stores also sell “rash guards” for babies, much like the kind worn by surfers to protect them from abrasions. To keep your little one looking and feeling cool, you may also want to purchase a pair of appropriately-sized sunglasses with UV protection. Hydrate, hydrate, hydrate. Make sure that you and your family drink plenty of water, even if you’re not thirsty. Consider packing a jug of water in a cooler, as well as non-disposable water bottles that you can refill as needed. Also, plan ahead for feeding (and changing) your baby to ensure that any formula or milk is kept cold and doesn’t go bad. By following these sun safety tips, your family and baby can better enjoy all that the beach has to offer.